The Department of Science and Technology, Food and Nutrition Research Institute (DOST-FNRI) held back to back events to launch DOST- FNRI's new projects, nutrition tools & partnerships and recognize partner LGUs and technology adoptors in implementing Malnutrition Reduction Program (MRP). These were held on July 27, 2018 at Dusit Thani Hotel, Ayala Center, Makati City. Event 1 called Food and Nutrition Science for the People (FNSFTP) informed stakeholders of government and private sector involved in food, nutrition and health on DOST-FNRI's new projects and partnerships for the improvement of nutritional status of Filipinos. 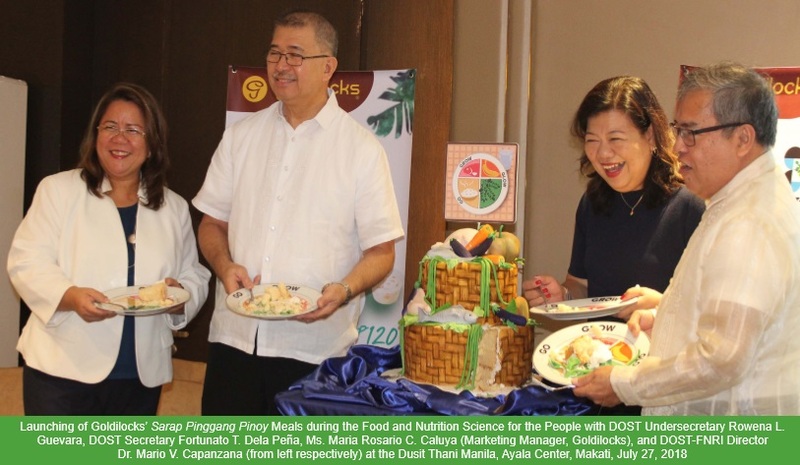 This is the DOST-FNRI's contribution in making food and nutrition R&D truly part of science for the people. One of the highlights of the FNSFTP was the launching of the Public Use Files (PUF). Data users can now fully maximize the use of the National Nutrition Survey (NNS) semi-processed data in the form of public use files. Thus, using the Public Use Files can help strengthen the development of programs and projects through data analysis and policy formulation. To promote healthy dining out, the DOSTFNRI and Goldilocks included the calorie content of Healthy Plate 1 (Ginisang Monggo and Daing na Bangus set) and Healthy Plate 2 (Pinakbet and Daing na Bangus set) and added another Pinggan Meal (Sauteed Veggies and Chicken Barbecue set). Each meal is served with steamed rice, fruit gelatin and bottled water. With the calorie content printed beside the menu of Pinggang Pinoy Meal, costumers will be aware of how much calories they are consuming in one meal. Other highlights of the event were the launching of Pinggang Pinoy Plating Challenge and nutrition tools like the Food Exchange List (FEL), Philippine Dietary Reference Intake (PDRI), and the Nutritional Management Guidelines and Recipe book. The nutrition tools will aid health workers in assessing adequate nutritional requirement, and help families and communities better appreciate and understand nutrition. A total of 11 memorandum of agreements and understanding were signed to celebrate public-private partnerships with various sectors like industry, academe, international organizations and other government agencies. This is to ensure their involvement and support to food, nutrition, and health initiatives of the agency. Event 2 was the awarding ceremony for the winners of KABALIKAT (Kabalikat ng Lipunan sa Kalusugang pang-Nutrisyon at Teknolohiya). KABALIKAT recognizes the excellent performance of LGUs and technology adoptors as invaluable partners in Malnutrition Reduction Program (MRP) areas. Winners for the Local Government Unit (municipal level) Implementors of DOST-FNRI's Malnutrition Reduction Program were Mercedes Camarines Norte followed by Catarman Northern Samar and Brooke's Point, Palawan. Winners for the Outstanding FNRI MRP Technology Adoptors were Nutridense Food Manufacturing (Large Scale), E. Zobel Foundation, Inc. (Medium Scale), and LGU of Catarman, Northern Samar. They have been implementing the DOST PINOY for at least two (2) cycles of complementary feeding for 120 days, passed and implemented local resolutions or ordinances in support of MRP and allocated local funds and generated external funding sources for the implementation of MRP. These new projects, nutrition tools and collaborations coupled with strong commitment will help achieve our vision of a healthy and food secure country.